The essential skill of cartoonists lies in presenting a visual setup so that it can be comprehended at a glance. The more adept they are in this, the easier it is to miss their formal strength–because I get it at once, ha ha, and move on. Why linger? 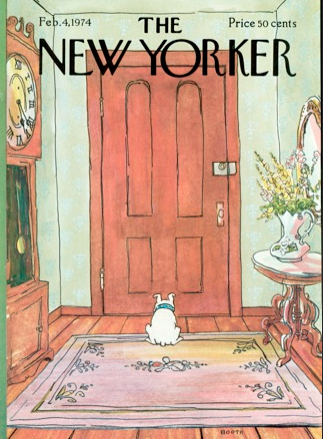 For example, this New Yorker cover by the complex and versatile George Booth (b.1926). The dog is the center of interest, both formally (Camille Corot recommended placing a white shape in the center of a composition) and dramatically. The dog is where the action is, especially if you are familiar with Booth’s dogs (a typical sample, left) so that you pick right up on the personality of the beast in the present case. But the entire space is lovingly described: the squared-off rectangles of wall and door (with tall, oval-topped panels, hinges, locks); receding floor planks in the same pale, mottled red; the rug with floral doodles that pick up the flowers in the vase; the oval table, mirror, clock face, and pendulum weight; the table legs that rhyme the dog’s hind legs; the squares and rectangles of the clock; the colors: strong greeny-blue in the clock, repeated in the dog’s collar, softer in the flowers, paler still on the walls (reinforced by the green stripe down the left side); lavender rug repeated deftly in the clock, the table, the flowers, and the mirror. And all described in a simple but slightly wavering line that lets Booth be clear without ever falling into niggle. Even the typographical elements at the top are factored in: in anticipation, Booth has left the top a little light and loose. The block of type prevents the eye from drifting out the top, and presses down so that the white dog commands the eye more forcefully than it otherwise would. I noted in the April 13 post on Rembrandt that his images are full of richness, but the details don’t compete with the essential hit. You have to linger and look for them. Rembrandt & Booth, Booth and Rembrandt: the craft of storytelling hasn’t changed.